This statistic shows the growth of mobile app usage in Canada in 2016, by category. During the reported period, sports apps experienced the highest growth with 172 percent compared to the previous year. Mobile usage trends in Canada are proving to be difficult to follow, and in turn problematic to forecast, as the ever-changing environment fluctuates year-over-year. For example, the calculations of mobile activity among the Canadian population in 2015 pointed to a shift towards healthy living, with health and fitness apps seeing the highest growth in usage. Yet, in 2016 the focus was on sports apps, followed by messaging and social apps. Recent estimations determined that in 2015 there were over 13 million mobile messaging app users in Canada, which would account for 37 percent of the total population. 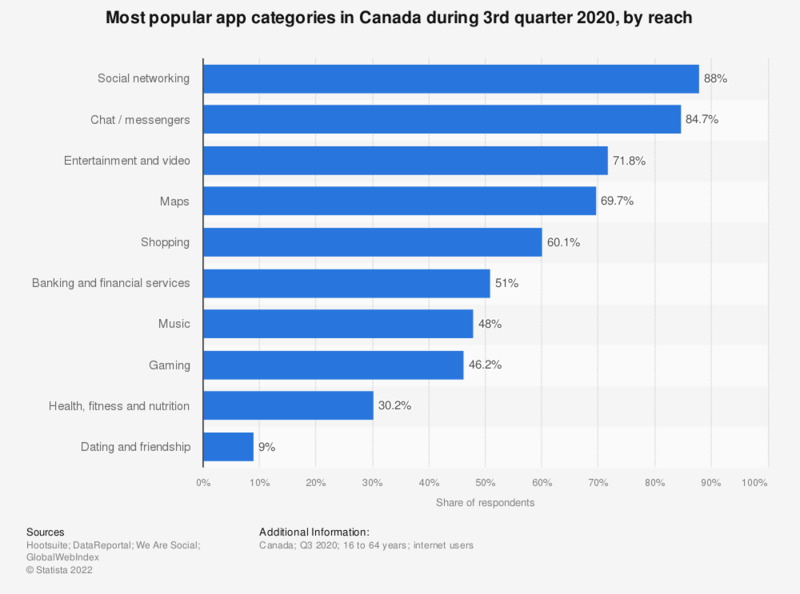 By 2019 it is expected that more than half of Canadians will be using over-the-top messaging apps on their phones, adding up to some 20.7 million users. A 2015 age group comparison shows that teenagers accounted for the majority of social and messaging app sessions as well as entertainment app sessions, while nearly half of app sessions for news and productivity categories belonged to users aged 35 to 54. Gaming app sessions were dominated by seniors and followed by 35 to 54 year olds. All in all, Canadian smartphone users surveyed in 2015 downloaded a monthly average of 2.67 apps onto their device and uninstalled 5.27 apps. In fact, the average number of apps on Canadian smartphones fell from 26 to 19 between 2014 and 2015. In terms of actual monthly use, younger generations were using more apps on their phones – nearly 9 apps reported by respondents aged 18 to 24, compared to 3 apps used monthly by senior Canadians.